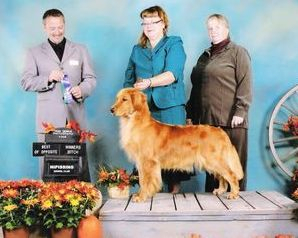 Here are the breeds recognized by the CKC in the Sporting Group. At the bottom see some of our club members with their Sporting Dogs. Club member Elizabeth Numbers (handling) one of Saundra (pictured, also club member) and Jim Fare's Golden Retrievers. 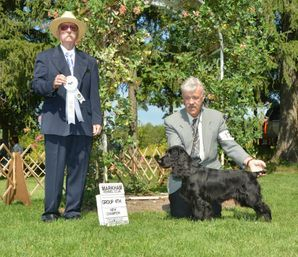 Club member Peter Archer with his homebred Field Spaniel, "Scarlet" finishing her Canadian Championship with a Group 4th placement. Club Member Bronwyn MacDonald showing her Weimaraner "Molson" (Ch. Instar's Simplee Canadian CGN) to a Best of Breed win over Specials.